In order for this to be explored in context, I must repeat a portion of my first blog, “Puttering around East Texas”, published in May 2011. You may check the archives if you wish to read the entire blog. “I have one of those quite placid names. It evokes no imagination, no illusions, nothing that would conjure up an interest in reading the words before you. Thus, it became rather difficult to name my blog. I certainly want others to read what I have to say, (as if I really had something to say). However, in order to do that, the name must immediately grab the reader’s attention. Therefore, it must be “unique”. I settled on rancher, writer, poet. First, I am not a rancher; I just thought it sounded good. I am however, a writer and a poet. You, the reader, will have to decide if I can use the adjective, “good”. I have these images of a cowboy roping and riding with a six-gun at his side. He wears a cowboy hat, a plaid shirt and denims. He sits tall in the saddle and talks funny. He hustles his cattle across the wide-open range, disperses rustlers and evil land grabbers, and is always trying to protect the fair maidens from harm. He has sons named Adam, Hoss, and Little Joe. To me, that is a rancher. Well, now it is official. I am, at last a rancher, at least by marriage. My wife and I were married in May 2009; however, until recently I did not realize I had married a “rancherette”. I knew that she was a dog breeder and an animal lover when I married her. I am fine with that. With eight Standard Poodles, and a couple of rescue dogs, we were in the “business”; however, I do not think this qualifies me as a “rancher”. Thus, I was unprepared for what “the rancherette” did next. Did you know, one could order twenty-five chickens online? They mail them to you. They arrive at the post office. They come in a little box with holes in the side. United States Priority Mail. To the post office. Two-day delivery. The postmaster called this morning and said the birds had arrived, could we come pick them up because they were cheeping and wanting to come home. I thought perhaps they could have given them flight plans and flown, but they don’t yet know how to read or fly. These baby chicks, mailed only a day after they are hatched must be taught how to eat and drink. Dip their little beaks in water so they know what water is and poke their little beaks in food. One might wonder why their momma did not teach them. Well, it is because they were taken away from their momma even before they were born, uh, hatched. You see, they have these little trays called incubators and the eggs go into those little crates as soon as they are laid. 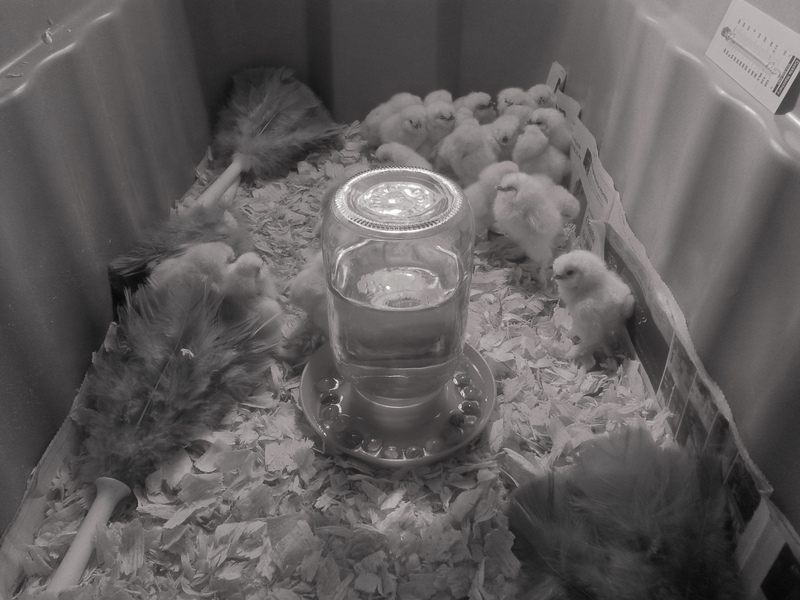 There, thanks to technology, the little trays automatically turn the eggs every so often until the eggs are hatched. So, they don’t ever get to know their momma. But, not to worry, us humans can substitute for their momma. So, in the tub, they went. The “rancherette”, took each little critter, one at a time, poked his/her head in the water. Funny thing about that gender stuff. We don’t know which is which. Won’t know until they get big or start crowing, whichever comes first. Anyway, they took one little drink and was hooked on the stuff. I don’t think they had ever had a drink before. Then she gently stroked each one and poked his/her head to the food. Guess what? They were hungry. You would be too, if you had never tasted any food before. Luckily, for me I married a “rancherette”. Hoo boy, now I am a “rancher”. There is such a thing as a chicken rancher, isn’t there? Osmosis, you know. You should see me in there herding those little critters. Git along, little dogie, git along. Them little rascals are sure hard to rope, but I’ll learn. I can’t wait ’til they get bigger. The “rancherette” ordered twenty-five, but got twenty-seven. One died, so that left us with twenty-six. I looking online for baby names, now. Maybe, I’ll just use the alphabet. Maybe you might be interested in becoming a “rancher!” this is a picture of the “herd” They are called “Silkies”. I gotta go build a coop now. Cluck, Cluck! Help me out here, Little Joe.